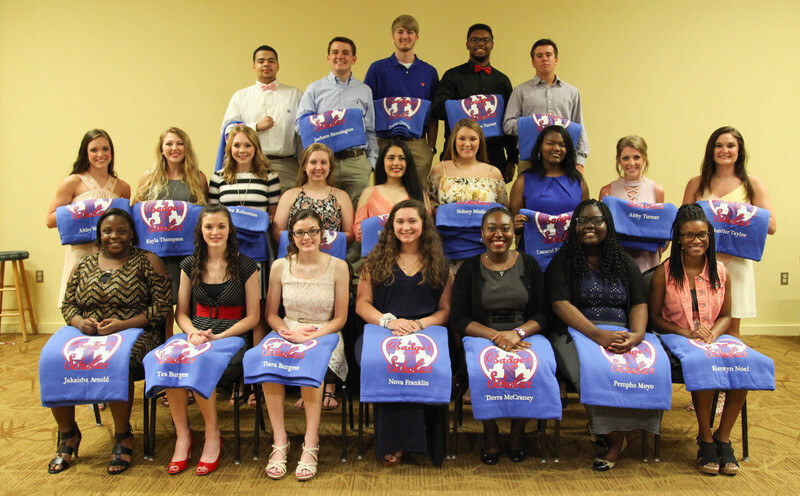 Arkadelphia High School awarded Badger Scholar honors to 129 students during the 37th annual Badger Scholar Banquet on May 15. This year, over 400 people attended the Badger Scholar Banquet, located at the Garrison Center Ballroom on the campus of Henderson State University. The Badger Scholar Program, partially funded by the CONE Foundation and Henderson State University, is an academic reward program for Arkadelphia High School students, beginning under the administration of AHS Principal Dr. Steve Castleberry. Dr. Castleberry wanted to motivate students and reward them for their academic achievement. During the inaugural year of the Badger Scholar Program, only around a dozen AHS students were honored. In 1986, AHS Principal Herman Thomas and a student committee redesigned the program to the format used today. In order to become a Badger Scholar, students must sign an intent form declaring interest in becoming a Badger Scholar and maintain at least a 3.5 GPA for each of the first three nine weeks. The First Year Badger Scholars are awarded a Badger Scholar pin and certificate at the ceremony. Second Year Scholars receive a Badger Scholar t-shirt. Third year Badger Scholars receive a personalized plaque. Fourth Year Badger Scholars receive a personalized letterman blanket. All Badger Scholars are awarded a locker in an area preferred by the students. First Year Badger Scholars for 9th grade include: Cabb Batson, Caleb Cornelius, Kristen Curtis, Olivia Dixon, Aisha Faiq, Wyatt Forthman, Sawyer Goodrum, Madison Green, McKinley Green, Darbeigh Hale, Patrick Hayes, Kristine LeGuin, Lynli Lowry, Hannah More, Sydney Motl, Yebo Moyo, Reece Nowlin, Eli Perrin, Cannon Turner, Cole Turner, and Staton Whitten. First Year Badger Scholars for 10th grade include: Samuel Coventry, Morgan Daniel, Lynn Duncan, Devin Jensen, Madison Lamb, Alex LeGuin, Kylee Overturf, and Jamari Whitaker. First Year Badger Scholars for 11th grade include: Carson Almond, Niya Box, Jamiah Brumfield, Emesha Larry, Lyndi Porter, Carson Smith, Symone Jones, and Jenna Purifoy. First Year Badger Scholars for 12th grade include: Kayla Barnes, Rachael Jarrett, and Brianna Tucker. Second Year Badger Scholars for 10th grade include: Mary Jane Adame, Ally Adkison, Tyler Allen, Kamryn Bell, Caroline Cissell, Garrett Collie, Caroline Derby, Michael Evans, Hannah Fenocchi, Addy Groom, Sumner Huerkamp, Camille Jones, Nicholas LeVar, Colleen Lloyd, Shannon Mecum, Faith Ochello, Jenna Patterson, Owen Phillips, Alec Ruble, Diana Summerville, Lauren Trippett, Trudy Vo, Josh Wallace, Andrew Webb, and Angelmaa Wempe. Second Year Badger Scholars for 11th grade include: Baylee Bethell, Keaton Goodrum, Kristopher Hall, Angel Marciano, Drew Saunders, and Foxx Ward. Second Year Badger Scholars for 12 grade include: Evelyn Durrett, Jalise Hayes, Kenzi Land, Cole McMillan, Destiny Walker, Kiki Youmans, and K’lee Zeagler. Third Year Badger Scholars for 11th grade include: Elizabeth Adair, Khennedy Brunson, Jack Burnham, Jimmy Castro, Mollie Daniell, Parker Davis, Fateemah Faiq, Allie Harris, Scott Holbrook, Blanton Matthews, William Matthews, Ryan Motl, Radreka Perry, Taylor Savage, Ashlyn Taylor, Kacie Thomas, and Haley Zeiler. Third Year Badger Scholars for 12th grade include: Mikayla Adams, Griffin Brown, Nicholas Gerber, Rachel Gierth, Macey Green, Aabrejah Hill, Christopher LeVar, Autumn Loy, and Nia Nelson. Fourth Year Badger Scholars include: Jakaisha Arnold, Jack Bennington, Tea Burgess, Tiara Burgess, Preston Crowder, Nova Franklin, Jared Garner, Keawanna Hale, Jatasia Jenkins, Tierra McCraney, Sidney Medley, Pempho Moyo, Kierstyn Noel, Turner Pentecost, Cameron Porchia, Stephany Quintero, Emilee Roberson, LaCarol Rone Newborne, Alexis Summerford, Chandler Taylor, Kayla Thompson, Abby Turner, Dalon Turner, and Abby White.